But the book’s main purpose is to provide an account of Winston Churchill’s actions and their intended consequences  as well as some of the unintended ones  for readers who are unlikely to read a military history book of 800 pages. The author has pared down the details of this at once fascinating and frightening story to an accessible length of how the world nearly ended in the 1940s. 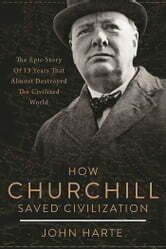 How Churchill Saved Civilization was written in honor of all those who sacrificed their lives in the War, and to caution readers that it could very easily happen again, as key factors like complacency, ignorance, and weakness continue to play a role in international diplomacy.